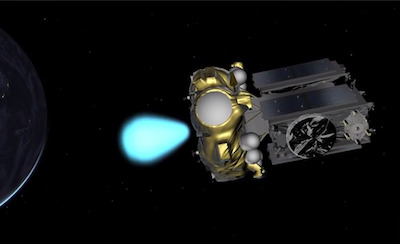 European and Russian engineers are studying the cause of Friday's botched launch of two Galileo navigation satellites, with the initial focus of the investigation on the Soyuz rocket's Russian-made Fregat upper stage, Arianespace announced Saturday. "According to the initial analyses, an anomaly is thought to have occurred during the flight phase involving the Fregat upper stage, causing the satellites to be injected into a noncompliant orbit," Arianespace said in a statement. The 1,600-pound satellites lifted off aboard a Soyuz ST-B launcher at 1227 GMT (8:27 a.m. EDT) Friday from the Guiana Space Center on the northern coast of South America. The three-stage Soyuz booster appeared to function normally before a Fregat-MT upper stage took over to position the spacecraft in a targeted medium Earth orbit. Officials have not said whether the two Galileo satellites, which carry propellant for limited maneuvers in space, can recover from the orbital injection error or can broadcast usable navigation signals from their current positions. 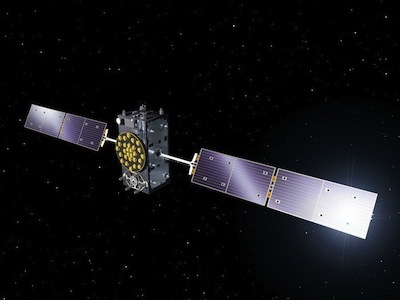 "Following the announcement made by Arianespace on the anomalies of the orbit injection of the Galileo satellites, the teams of industries and agencies involved in the early operations of the satellites are investigating the potential implications on the mission," the European Space Agency said in a press release issued Saturday. The Fregat rocket stage, manufactured by NPO Lavochkin of Russia, was supposed to put the two payloads in a circular orbit 23,522 kilometers (14,615 miles) above Earth with an inclination of 55 degrees. But the upper stage deployed the twin Galileo satellites in an incorrect orbit with a low point of about 13,700 kilometers (8,500 miles) and a high point of approximately 25,900 kilometers (16,100 miles), according to tracking data from the U.S. Air Force's space surveillance network. In a statement released Saturday, Arianespace said data provided by European Space Agency and French telemetry stations showed the Galileo satellites in an orbit tilted at an angle of 49.8 degrees to the equator. Officials gathered at the launch base in French Guiana initially declared the launch successful, giving customary post-launch speeches with no indication of any alarm. The satellites are safe and under the control of the European Space Operations Center in Darmstadt, Germany, ESA officials said. Arianespace says the Fregat upper stage was purged of residual propellants and depressurized normally, a measure to reduce the risk of a debris-generating explosion. The Fregat-MT upper stage that launched Friday was modified to carry additional propellant tanks. The orbit injection error was the second anomaly with a Fregat upper stage in 45 missions since its first flight in 2000. A Russian military communications satellite was deployed in the wrong orbit in a launch in May 2009. The Fregat upper stage is designed to fly on top of Soyuz and Zenit rockets. Its engine can fire up to 20 times in a single mission. "Our aim is of course to fully understand this anomaly," said Stephane Israel, chairman and CEO of Arianespace. "Everybody at Arianespace is totally focused on meeting this objective." Russian ground crews manage hands-on Soyuz launch preparations and the final countdown from a control center near the launch pad on the northwestern frontier of the Guiana Space Center, which is also home to Europe's Ariane 5 and Vega rockets. But Arianespace has final authority for Soyuz missions taking off from French Guiana. Friday's liftoff was the ninth time a Soyuz rocket has launched from the tropical spaceport since beginning operations there in 2011. It was also the first flight of fully operational Galileo navigation satellites for the European Commission -- the executive body of the 28-nation European Union. The launch was supposed to kick off a rapid-fire series of launches by Soyuz and Ariane 5 rockets to build out Europe's civilian-run counterpart to the U.S. Air Force's Global Positioning System. ESA acts as a technical agent for the European Commission-led Galileo program. "Starting Monday, Arianespace, in association with ESA and the European Commission, will designate an independent inquiry board to determine the exact causes of this anomaly and to draw conclusions and develop corrective actions that will allow us to resume launches of Soyuz from the Guiana Space Center (CSG) in complete safety and as quickly as possible," Israel said in a written statement. Arianespace said the investigators will coordinate with the company's Russian partners, including the Russian space agency Roscosmos, Soyuz contractor TsSKB Progress, and NPO Lavochkin, manufacturer of the Fregat upper stage. "Arianespace is determined to help meet the European Union's goals for the Galileo program without undue delay," Israel said. "We would like to thank ESA, the European Commission and CNES for the very productive discussions since becoming aware of the occurrence of the anomaly. While it is too early to determine the exact causes, we would like to offer our sincere [apologies] to ESA and the European Commission for this orbital injection that did not meet expectations." Before Friday's mishap, the next launch of a Soyuz rocket from French Guiana was scheduled for December with the next two Galileo navigation satellites.